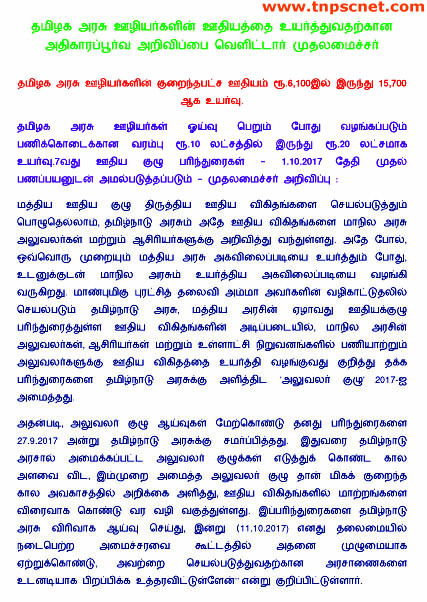 The Tamil Nadu cabinet panel has announced the implementation of 7th pay commission plan for its states employees. Government has set up a committee that will look into the process of implementation of the plan for the employees. The panel is expected to submit its report to the cabinet latest by June 30th. According to the new recommendations it is certain that nearly 18 lakh employees of the state shall get the benefit of it. Apart from this the plan is also expected to benefit many teachers working in the government owned schools. 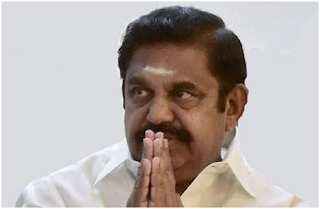 The Tamil Nadu cabinet on Wednesday approved the Seventh Pay Commission recommendations which will benefit more than ten lakh government employees and teachers in the state. A cabinet meeting chaired by chief minister Edappadi K Palaniswami approved the pay commission recommendations after a high-level committee headed by finance secretary K Shanmugam submitted its report to the government recently. The cabinet gave its nod for the order to be issued," said a source. There will be 20% hike in the salaries of government employees and teachers. The committee shall be working under the supervision of the state CM Mr. E K Palaniswami. It is also stated that the committee shall be formed comprising of five members from the state cabinet. CM had made an official announcement that the committee shall be comprised of senior officials from the state cabinet, Girija Vaidhyanathan (Chief secretary) and four ministers from the state ministry. It is also certain that the committee shall also appoint secretary from school education, home secretary, labour secretary, finance secretary and member secretary who shall be responsible for making the recommendations for implementing 7th pay commission plan. Apart from this the committee shall also be responsible for making all possible changes before implementing the pay commission plan. According to the latest pay commission recommendations it is certain that the government had announced a hike of around 14.27 percent towards the basic pay for the employees working in the state government sectors. It is also certain that the final decision for implementation shall only be done after the report is submitted to the cabinet. The government has also announced that along with revised salaries it is also working for higher pension payouts for the employees. All other allowances will also have to be calculated once the official reports have been submitted. To calculate the new revised salary you have to consider your basic pay for the last pay commission. As the government has announced to hike the DA by 125 percent so this amount can be added to the basic pay to get the new revised salary. Apart from this another 14.27 percent of the basic pay should be added to this to get the new revised gross pay for the employee. With the implementation of the 7th pay commission in Tamil Nadu it is certain that employees will get full benefit of it. The government of Tamil Nadu certainly has also taken fresh measures with an aim to implement the plan in the state at its earliest. Before making the implementations it is certain that the state government shall study the report prepared by the committee. The state government has also given the deadline till June 30th to the committee for submitting its report. On the basis of notifications, the government has notified the cabinet to revise allowances and salaries for employees enrolled under state government payroll. The pay plan is also aimed to offer all possible benefit to lakhs of employees in the state. According to the latest statements made by the officials, the government is also looking forward to offer the benefit of the pay commission to school teachers working in government schools in the state. The 7th pay commission also has recommendations for increasing the HRA offered to the employees.